A few months back, I wrote about the great earring debate in our home. My son wanted to get his ears pierced and we were trying to figure out how to handle this request from a not quite 10 year old. It’s stylish and has many advantages over the earring, chiefly that there is no piercing involved. Simply slide the cuff over your ear and into place and you are hip. 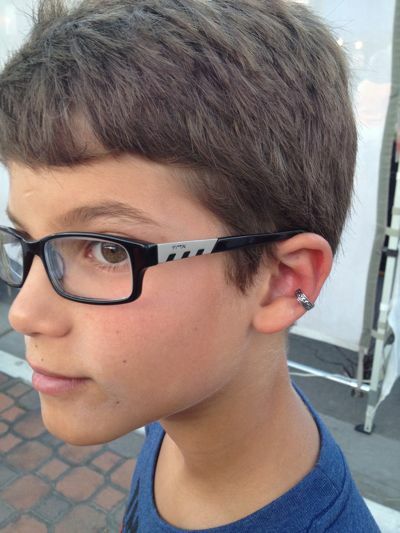 My son loves his new ear cuff. He can put it on and take it off whenever he wants, just like the ring he wears on his finger. Piercing didn’t work for me. I tried it, but the piercing got infected and so I abandoned it. Whenever I wanted to look a bit more bohemian, I’d slip on the cuff and let my flowing locks hang down. Those were the days – the heady, late 80s. Who knew there’d be a parenting trick hidden in there.